This course will explore language invention through the works of the greatest and most prolific inventors of language for fictional works and world building – J.R.R. Tolkien. There are arguably two elements of Tolkien’s creative work that readers tend to skip over to “get to the good parts.” One of these is Tolkien’s brilliant poetry – the beauty and excellence of which Dr. Corey Olsen explored in his Tolkien’s Poetry course. Now we would like to invite you to explore the second crucial element of Tolkien’s creative work which is often neglected, or passed over with head scratching puzzlement, by readers – Tolkien’s Invented Languages. This course will explore language invention through the works of the greatest and most prolific inventors of language for fictional works and world building – J.R.R. Tolkien. In his lifelong work on his legendarium, Tolkien, at both heart and mind a philologist, put language invention at the core of his mythology. Tolkien narrative and para-textual work is infused with his invented names for people, places and items, as well as the use of these invented languages in dialogue, prose and poetry. The interdependence of invented languages and mythological narrative permeates the entire Legendarium Tolkien would work on for over sixty years and is a crucial and consistent element of his world-building. This course will be taught in three key parts. In part one, we will set a context for Tolkien’s language invention by exploring the tradition of invented languages which Tolkien was working from, building upon and responding to in his own creative work. This will include the reading and discussion of primary texts and secondary analysis of some of the major invented languages before Tolkien and an exploration of their linguistic, narrative and cultural contexts and, in several cases, what elements of them Tolkien responded to in his language invention. In the second part of the course, we will study in-depth analysis of Tolkien’s own “nexus” of Elvish and other invented languages by exploring the theory behind Tolkien’s language invention and analyzing the corpus of languages Tolkien created – from pre-Legendarium languages like Nevbosh and Naffarin through the languages Tolkien created coeval and codependent with his Legendarium. Then, we will explore the audience/reader reception of Tolkien’s languages and examine they have been used online and in various media, including the recent Peter Jackson films. We will also discuss and debate the question of whether Tolkien’s languages can be used for practical writing and conversation (as many have tried to do). 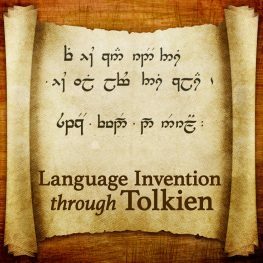 In the third part of the course, we will explore the legacy of Tolkien’s language invention by examining several invented languages contemporary with Tolkien and the invented languages that play an integral role in today’s multi-textual narratives of franchises like Star Trek, Star Wars and the HBO series Game of Thrones. The course will anticipate the publishing in Spring 2016 of a new edition of Tolkien’s foundational talk on language invention, “A Secret Vice,” co-edited by Dimitra Fimi and Andrew Higgins, which Tolkien delivered in the early 1930s. The co-editors will offer several follow-up lectures on the currently unpublished material that will appear in this volume. No prior knowledge of invented languages is required. The objective of this course is to look at invented languages from both a theoretical and practical point of view. Students will learn about the different phases of Tolkien’s development of Quenya, with a focus on the language’s structure, grammar and morphology. Special attention will be paid to the theory of Tolkien’s language development, as well as the other key invented languages that both proceeded and followed his work. Language Invention Through Tolkien will meet on Wednesdays and Fridays from 4 pm – 5:30 pm Eastern Time. Handouts from excerpts from Rogers and Conley & Cain on each of the specific texts and languages as well as online resources. Note: Daylight Savings Time for 2016 begins on March 13 in the U.S. This may cause a shift in time of the class for students in other countries after this date. A Secret Vice, edited by Andrew Higgins and Dimitra Fimi, will be released April 7, 2016, in the U.S. A follow-up session featuring discussion with Higgins and Fimi will be scheduled for after the book comes out.